STREAM Collaborative is leading the design of the first mixed-use building on Inlet Island, scheduled to be constructed in early 2015. 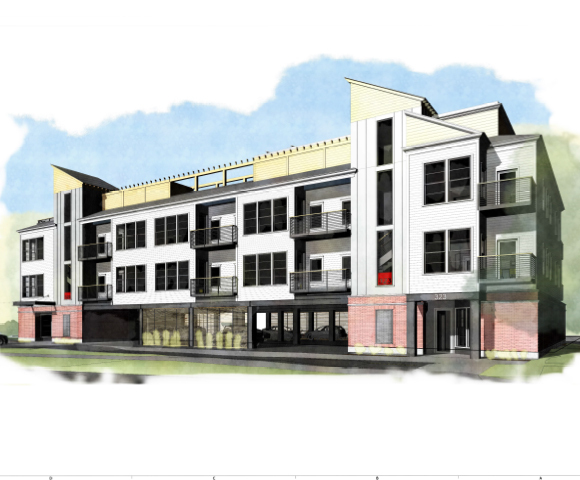 The 20-unit market rate apartment building includes ground floor commercial space and 18 covered parking spaces. The building sits directly on the old Cayuga Inlet with a public promenade enhanced with boat slips, improved hardscape and plantings. The project is conceived as a catalyst for future redevelopment of the island per the city’s urban design plan. The building design is inspired by the industrial waterfront history of what was once known as “The Rhine” district. The new facade features historic and contemporary elements of rustic bricks, steel, traditional clapboard siding, and window casings. The building is designed with private balconies as well as a rooftop terrace, greenhouse, and extensive solar roof panels.